Free Acid Value = 50 *Learn about FAV here. This lactic peel is buffered. Buffering raises the pH level of the acid so that it does not work too quickly. A higher pH level will slow-down the action of the acid, and is thus safer for an at-home peel. This 50% lactic peel is perfect for the do-it-yourself-er or first time peeler. Lactic is a great choice for those dealing with aging and pigmented skin - think liver spots and freckling. Lactic Acid will exfoliate the outer surface of the skin and encourage new cell turnover. It is a natural humectant, pulling moisture from the collagen levels to the surface of skin. We have Cleopatra to thank for this peel. When milk turns sour, the lactose is converted by bacteria into lactic acid. When Cleopatra chose to bathe in sour donkey milk, the lactic acid was able to help exfoliate her skin and keep it smooth and beautifully clear. Milk wasn't the only acid used by the Egyptians, though it was the most popular. Tartaric acid was another favorite. It comes from old wine. Photoaging (fine lines, not course wrinkles). Gentle exfoliation - little to no visible flaking. If you are on the sensitive side, you will really enjoy lactic acid. It has a very large molecule that will make the peel experience more pleasant. This treatment is relatively non-irritating with very little, if any, down time. Our Lactic acid peel has been enhanced with a "skin lightening" and " anti-aging" cocktail of herbal remedies. Contra-Indications: Milk Allergies If you are ready to move to a stronger acid, our TCA 13 is another excellent choice for pigmentation and antiaging with more peeling. View our simple hydroxy acid peel demonstration. Lactic will be applied in exactly the same way. All hydroxy acids are applied, timed and then rinsed off to either dilute or neutralize the acid. What kind of peeling can I expect? With lactic acid there is very little, if any visible peeling. Lactic is considered a Very Superficial peel (more of an exfoliation), meaning that it only penetrates into the outermost layer, the Stratum Corneum. It will smooth your skin, and the majority of exfoliation will be on a molecular level. This does not mean that it isn't working though. Flakes are not necessary for changes to occur within the skin. This is the perfect peel for someone that wants refreshed, new and glowing skin, but doesn't want to deal with the dryness and flakes a stronger peel will have. Continual use is recommended for best results. You can apply this peel one time per week indefinitely. It is also OK to use during pregnancy and during breastfeeding (lactation). Lactic Acid 50, Purified Water, High Purity Lactic Acid, Sodium Hydroxide, Glycerine, Hydroxyethylcellulose, Benzyl Alcohol, Allantoin, Panthenol, Butylene Glycol, Hymulus Lupulus (Hops) Extract, Equisetem Hyemale (Horsetail Plant) Extract, Pinus Strobus (Cone) Extract, Citrus Limon (Lemon Bioflavonoids) Peel Extract, Rosmarinus Officinalis (Rosemary) Leaf Extract, Methylisothiazolinone. pH 2.5. (1/4oz., 2oz. and 4oz options). 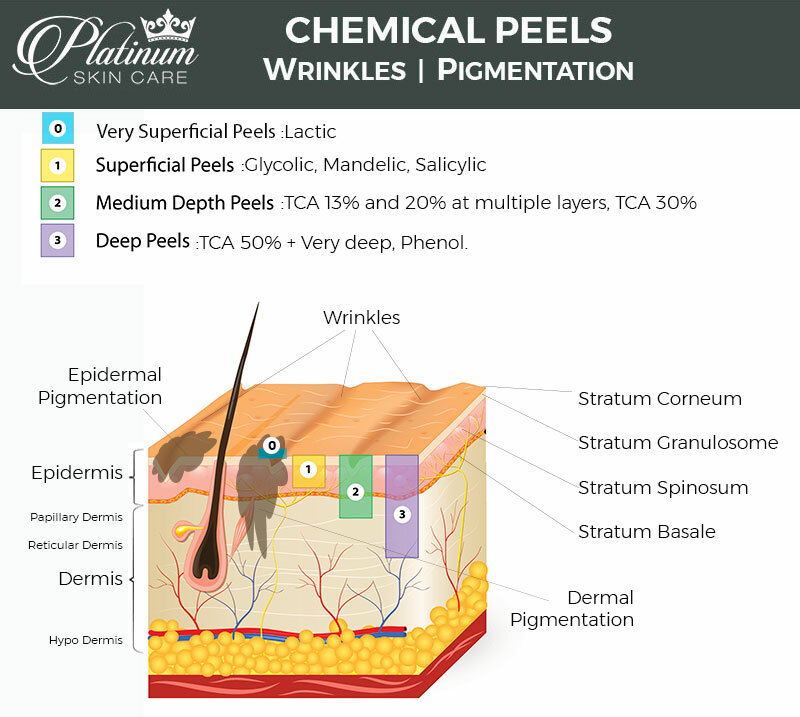 Platinum Skin Care Lactic Acid Peel | Who is it for?